Danone: Danone is the world’s leading dairy company, and is known in the USA as Dannon. Its principal sectors of activity are today fresh milk products (yoghurts, desserts), baby food and mineral water. It distributes some of France’s best known mineral waters, notably Volvic and Evian, and is the no. 2 worldwide in bottled mineral water. Danone became France’s leading food-processing group in 1973, on the merger of Gervais-Danone and BSN. It is a CAC 40 company. Dassault: Groupe Dassault is a French industrial group consisting mainly of armaments and aviation companies, specialised in jet fighters, the most famous of which is the Mirage. It also owns Socpresse, publishers of the daily Figaro newspaper. The Dassault group is one of France's great family companies, founded by Marcel Dassault, now run by his son Serge Dassault. DCRI Direction centrale du renseignement intérieur : New French Central Intelligence Agency, formed in 2008 from the merging of the two former rival intelligence agencies, the DST (Direction de la Surveillance du Territoire) and the RG (Rensignements Généraux). Debré, Michel: (1912-1996) Conservative politician, and right hand man of General de Gaulle. First prime minister (1959-1962) of the Fifth Republic. Debré was , with de Gaulle, one of the main authors of the constitution of the Fifth Republic. Débrouillardise: "Se débrouiller" means to get by on your own; débrouillardise is a quality admired in France, the ability to get by, even when things are often lined up against you. It is also an ability to get through or round administrative red-tape. Décathlon: large French international chain of sprotrswear and sports equipment stores. Décentralisation : regionalisation, decentralisation, devolution of power from the central government to regional and departmental authorities. France has a long legacy as a centralised state, dating back many centuries; the centralised structure of power has survived numerous regime changes in since the French Revolution. It was not until the election of a Socialist government in 1981 that any major steps were taken to reduce the importance of Paris. The first Loi de Décentralisation, passed in 1982, transferred certain powers to the regions, and since then further powers have been devolved, including responsibility for lycées (though not the recruitment of their teachers), regional public transport services, and the management of certain social services. Regions are now governed by elected conseils régionaux, under the leadership of a Président de région. Decrees. Much administrative and civil legislation in France is passed by means of decree, rather than being put through parliament. See politics and government. Delors, Jacques - A French catholic socialist politician, former President of the European Commission (1985-1995). Father of the leading French socialist politician Martine Aubry. Delors' socialist-catholic vision of European integration was strongly at odds with the "anglo-saxon/protestant" views of Margaret Thatcher, and the two leaders disagreed vehemently over many issues. Demonstrations, (Fr. Manifestations) : Form of protest popular with students and trade unions, though less so than in the past. Département : County. 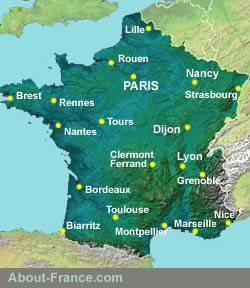 Metropolitan France is divided administratively into 96 Departments. The concept of the Department, as a territorial subdivision, has existed since the seventeenth century. The original list of 89 departments, numbered alphanumericially from A to Z, was fixed in 1860. Since then, seven new departments have been added. Department 90, the Territoire de Belfort, was made from the French-speaking part of southern Alsace in 1871, and Departments 91 to 95, the departments of the Greater Paris area, added in 1964. Department 20, Corsica, was divided into two in 1976. There are also four overseas departments, known as DOM (Départements d'Outre-Mer). The capital town of a department is known as the Préfecture, and since 2015 Department are administered by an elected Conseil Départemental (which replaced the former Conseils généraux) Departments are grouped together to form larger units, known as régions. Député: Elected member of the French parliament, the Assemblée nationale. See politics and government. Député-maire. A député-maire is not the mayor's deputy. This expression is used to describe a person who occupies two representative functions, that of député and that of mayor. See Cumul des mandats. DESS, Diplôme d'Etudes Supérieures Spécialisées - the former principal French post-graduate degree, usually obtained at the end of five years of higher education, and equivalent to a Masters. The DESS, like its pure research equivalent, the DEA, has now ben replaced by the new Masters qualification. DEUG - Diplôme d'Enseignement Universitaire Général: Certificate previously awarded for successful completion of the first two years of university study. The DEUG was phased out with the adoption by France of the "Bologna" diploma structure (known in France as LMD), for which the first higher education diploma is the Licence (equivalent of the BA), awarded after three years of study. Deux Chevaux (2CV)…… Nickname, la Deudeuche. Iconic minimalist French car, (see also Citroën). The first models of this car were produced in 1938, but the war stopped the project. The first 2CVs went on sale in 1949, and the last production line was closed in 1990 – bringing to an end an incredible 41 years of production. The original 2CV, with its spongy suspension, was designed as an affordable car for small farmers (paysans) and workers, a car in which one could carry a basket of eggs to market over France's poorly surfaced or unsurfaced roads, and arrive with all the eggs intact. Over five million "Deux-Chevaux" were produced by Citroën over the years, in France or plants abroad. Those that remain today are collector's items. Diagonale du vide, la : A.k.a. Diagonale aride : a large swathe of land running across France from northeast (the Meuse plain) to southwest (the central Pyrenees), via the southern Massif Central, where, for most of the twentieth century population was falling and the economy in decline, due to rural exodus. Since the start of the twenty-first century, the population in this area, covering some twenty departments, has at last begun to increase again, as a result of longer life-expectancy and of repopulation by emigrants from the cities and other parts of Europe. Digestif : A small glass of liqueur or brandy traditionally drunk at the end of a good meal, particularly on a festive occasion. Popularly known as a pousse-café. The tradition is perhaps still strongest in rural France, where there are still people, known as bouilleurs de cru, who have the right to produce their own spirits from their own fruit – calvados from apples in Normandy, prune from plums or kirsch from cherries in eastern France, and gnole or goutte (from grapes) in the south. However, consumption of digestifs has fallen heavily in recent years, notably on account of drink-drive laws. Directeur de Cabinet : the senior civil servant who, with the Minister, is in charge of running a government department or ministry. The French equivalent of a Permanent Secrety (Permanent under secretary of state) in a British government department. More generally, the salaried employee in charge of the cabinet (office) of a politician or elected representative..
Do-do: in children's language, a do-do is a sleep or a nap. Faire dodo means go to sleep. DOM the Départements d'Outre Mer, French overseas departments, two in the Caribbean (Guadeloupe and Martinique), one in South America (Guyane), and one in the Indian Ocean (La Réunion). Administratively part of France, and therefore with elected representatives in the French parliament, these overseas departments benefit from many special regimes, notably fiscal advantages. Droite, la: Generic term used to refer to the political right, or conservatives. French conservatism has in recent decades been rather different from conservatism in the UK and most other parts of Europe. Anchored in a patrician, nationalistic and litterally ‘conservative’ mode, France’s political right has long had a very ambivalent attitude to economic liberalism. Following in the tradition of General de Gaulle, who remains the point of reference for right-wing politicians in France to this day, la Droite, which has been in power for all but thirteen of the last fifty years, has stressed an attachment to existing traditions and institutions, and in so doing failed (along with left-wing counterparts) to modernise the nation and its economy. DS (Pronounced Déesse, i.e. "Goddess") See also Citroën. The top-of- the range model produced by car manufacturer Citroën from 1955 to 1975. When it first came out, the car, with its revolutionary aerodynamics and air suspension, was far ahead of its time. It was the perfect vehicle for cruising at unlimited speed on the very poorly-surfaced main roads of fifties and sixties France. It was said at the time that the surfaces of French main roads would never improve, because all decision-makers rode round in DS, so never realised how bumpy the roads were for other drivers.